Today on Seeds, Soil & Sun: How to Grow Cannabis we learn about Autoflower and Photo-period cannabis strains and no-veg grow techniques. We also re-pot, or transplant, a pair of Autoflower cannabis plants into a larger pot, mulch and manicure it to look and grow better. 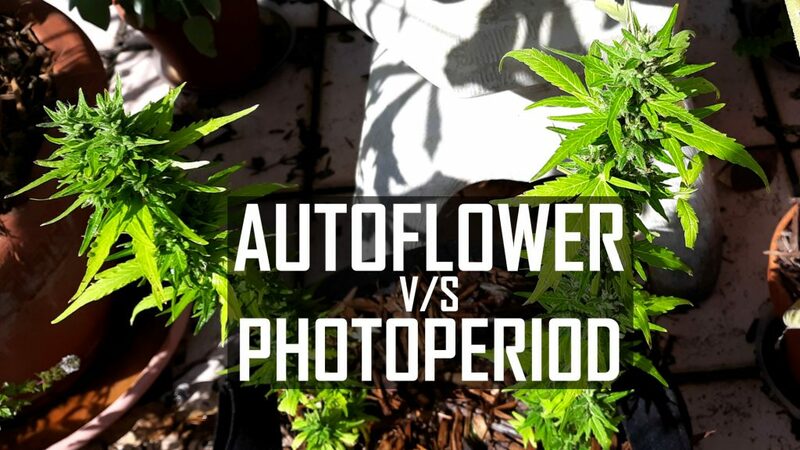 What are Autoflower and Photo-period varieties of cannabis? Autoflower Strains: Autoflower varieties are based on Ruderalis type that have very short vegetative growth cycle due to its location in Northern territories with short grow seasons. They have been genetically engineered in modern days to provide a very short grow cycle, but also short plants with fewer bud point nodes. Photo-period Strains: The standard Indica and Sativa strains are more Photoperiod based when it comes to grow cycles. These strains will not Flower until a specific amount of time of daylight to darkness is reached. What are no-veg growing techniques? You can get similar results to the Autoflower plant by shortening or even omitting the vegetative cycle of clones. Other techniques such as topping young plants and LST (Low Stress Training) can alter its shape or a plants height. Pre-Fill pot with moistened soil just until deep enough to cover original soil depth of plants. Carefully remove plant from old container holding by the base of the plant where it meets the soil. Gently place plant in new pot positioning it to stand upright and leaving room for other plant(s) if planting multiples. After all plants are placed gently backfill around and between then firm the soil in evenly around the plants. Fill the solid to within an inch or two of the top of the pot. Mulch around the plants to keep the soil cool and preserve moisture if desired. Trim any dead fan leaves. Water and replace in a nice sunny, but not too hot, place.